Skilled Craftsmen and Sound Citizens Result from Vocational Instruction of Students Preparing for Careers in Industry COMBINING the best features of old-time apprenticeship systems with the most modern methods of vocational education, trades schools are attempting to meet the wide demand of industries by developing enthusiastic students into full-fledged artisans possessing both practical and mental training. As many as 4,600 pupils attend a single trades school in a mid-western city, where they prepare for careers of productive labor, equipped with full knowledge and practical experience in such callings as carpentry, cabinetmaking, pattern work. 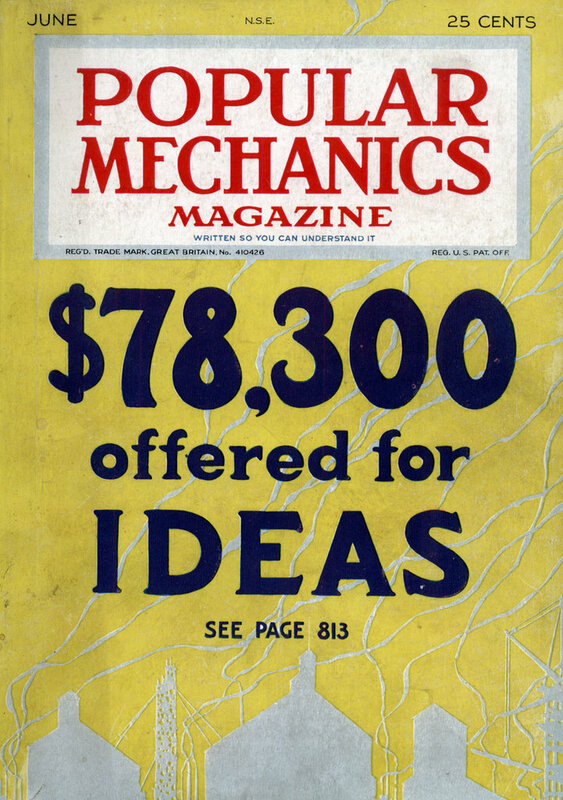 founding and forging, electricity, automobile mechanics, machine-shop practice, baking, and printing. Beginning the courses at an average age of fourteen, the youngsters enter upon the work with an enthusiasm which is reflected in the perfection of some of the products of their learning made in class periods. As in other trades schools, each department manufactures materials and furnishings needed by the other sections, so far as equipment permits, as part of the course. In this, the practical end of the training and the thoroughness with which the students perform the various tasks are tested in actual operation and fitness of the products. Only highly skilled and competent instructors, themselves schooled in academic as well as practical methods of crafts, are permitted to teach, thus insuring the pupil the benefits of the most modern and scientific practices. Unlike apprenticeships where only the mere mechanical training is accorded for a trade, without proper education of mind to direct the efforts of the worker, trades schools include the molding of good character and a sound knowledge of the citizenship in the education of the craftsmen. This insures to the industry a workman versed in not only the mechanical performances of his trade, but trained in proper conduct in association with others of his kind. While much has already been done in furthering the development of the industrial training institutions, skill and energy of the teaching forces are constantly adding greater advantages demanded by the pace set by industry. The pupil studying for a mechanical career finds that he is permitted to learn all about blue prints, mechanical designing, and construction of various metals and the action of different chemicals brought in contact with them. The young baker sees before him, in a laboratory which forms part of his schoolroom, ingredients prepared from widely differing grains and other food materials he works with. Bricklaying students are told the values of clays, and binding elements, such as mixtures of cements and sands, are analyzed for their information. In the end they enter upon their life’s work with full knowledge of the origin and purpose of the calling. Everything possible is done in the schools to insure the greatest amount of interest from the scholar. While they are being taught the work of the hand, considerable time is given to study of other subjects such as mathematics, history, English, geography, recreation, and hygiene. While these subjects are practical in their application to the things met after graduation, they are taught so that they fit in with the work in the shops. Modern methods of operation coupled with more or less cultural training are designed to fit the youth for rapid advancement when he enters upon the practice of his trade. In connection with these the processes of good citizenship are emphasized in a manner to insure the growth of sound character during later life. Where trades schools have departments for the vocational education of girls, millinery, sewing, dress designing and cutting, household sciences and courses that fit them for business and light factory supervision are accorded the students. 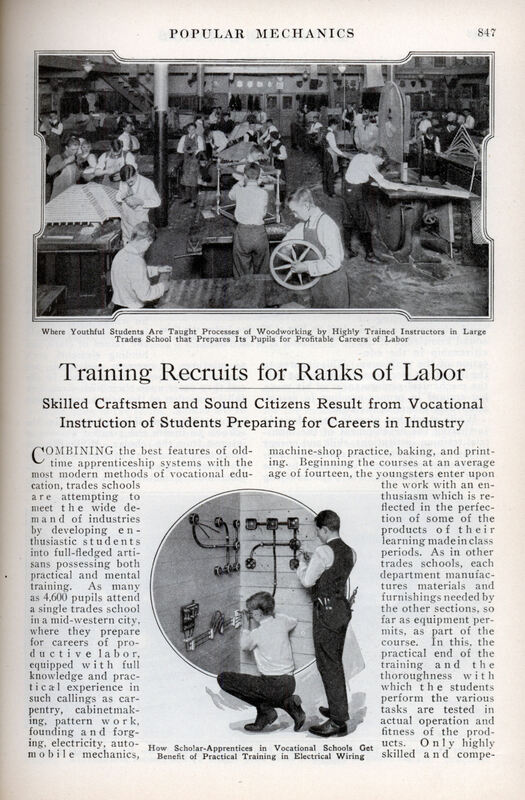 As with the other industrial studies the practical training is closely allied with the general education of the pupil, and in all cases only the most up-to-date examples of modern industry and commerce are permitted to form the pattern for the molding of the student-apprentice into a valuable recruit to the ranks of labor. Most of the courses run over a period of four years, but many may be completed in two and are so organized that the graduate will be sufficiently equipped to take up his or her calling at a point almost equal to the rating of a veteran. To a i d them in absorption of the latest developments in highly organized trade and factory methods, tours are made by the classes, under direction of instructors, through typical industrial plants and over structures in the course of erection, where first hand information can be gleaned from watching actual processes of trade practice.